Student’s will be exposed to many different art styles and get an opportunity to create works in a variety of different art mediums including painting, printmaking, drawing, clay, wire sculpture and more! Spring 2019 Semester (19 classes) Cost: $285 for MACC Members, $342 for Non-Members. There is a $50.00 supply fee at the beginning of Fall 2018 semester and another supply fee due at the beginning of the Spring 2019 semester. Checks should be made out to Art instructor. Payment can be submitted as cash, credit card, or a check made payable to the Monthaven Arts & Cultural Center. Art courses offered by The MACC are a series of lessons designed to develop and increase an individual’s knowledge, practice, and skill level in a specific art medium or art style. Our Art courses are comprised of 2 semesters. The first semester takes place in Fall 2018, beginning August 13th and ending December 21st. Spring semester begins January 7, 2019 and ends May 20. 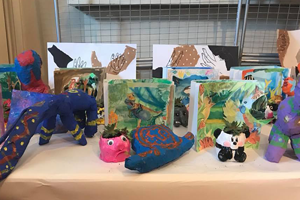 At the end of the course, The MACC holds an art show and reception displaying the student’s artwork and presents certificates of course completion.